Uses lovely herby sausages. Delicious comfort food. Cut the sausages into thick slices. Heat 1 tbsp of the oil from the peppers in a large pan and add the onion. Cook over a medium heat for 3 minutes until softened. Add the sausages and brown on all sides. Drain the peppers from the oil and add them to the pan. Cook for 2 minutes then add the tomatoes, breaking them up with a spoon. Season and simmer for 15 minutes until the sausages are cooked through and the sauce is thickened. Stir in the shredded basil. Meanwhile, cook the pasta according to pack instructions until just tender. Drain and toss with the pepper sauce. 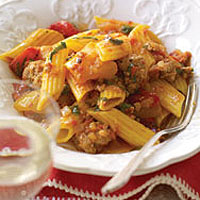 Serve with freshly grated Parmigiano Reggiano. Try this dish with other sausages, eg Unearthed Catalan Cooking Sausages with their distinctive flavour of fennel. A full bodied yet softly textured red will be perfect here. Waitrose Chianti Classico, Barone Ricasoli, Tuscany, Italy.